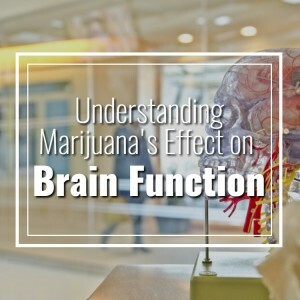 Although much is still unknown about the effects of marijuana use, there is ample evidence to suggest that marijuana has both short term and long term effects on brain function. Short term effects are experienced immediately, while long term effects are the result of a prolonged substance use disorder. When someone smokes marijuana, tetrahydrocannabinol (THC) quickly enters the bloodstream from the lungs. As the chemical is carried to the brain, it affects the cannabinoid receptors that generate a series of cellular reactions to create the high associated with the drug. Different areas of the brain have different concentrations of cannabinoid receptors, but the highest density is found in the parts of the brain that control memory, concentration, coordination, and sensory perception. The most compelling evidence of marijuana’s short term effect on brain function is the fact that marijuana is the illicit drug most often found in the blood of drivers involved in vehicle crashes. The most noticeable short term effects on judgement, problem solving, and coordination fade within 24 hours, but effects can still be felt as long as THC is in your system. Regular smokers can have positive urine test results 45 days after their last use, with heavy smokers having positive tests up to 90 days after quitting. During this time frame, it’s common for marijuana users to experience sleep problems and difficulty learning new facts or skills. It may seem reasonable to assume that marijuana only affects the brain as long as THC remains in the body. However, this is not true. A number of studies have shown cognitive impairment in the brains of those who use marijuana regularly but were not under the influence at the time of evaluation. Studies asking for self-reported data have found that heavy marijuana use during the teen or early adult years is linked with poor academic performance, greater unemployment, increased welfare dependence, and lower life satisfaction. MRI brain scans of marijuana users who began smoking in their teens found impairment in the neural connections between the brain’s left and right hemispheres as compared to their peers who had never used marijuana. This suggests that using marijuana during adolescence can result in poorer internal brain communication. Although the brain can change and develop throughout one’s entire lifespan, the most significant periods of growth occur before age 21. A New Zealand study found that people who begin using marijuana in their teens had lower IQs in their 30s compared to their childhood test results. The decline in IQ was most significant in the youngest and heaviest marijuana users. A survey of people who lived with frequent marijuana smokers asked about whether the smokers frequently experienced difficulty with memory or cognitive tasks. The survey found marijuana use that began in the teen years was associated with an increased difficulty in remembering facts and figures later in life. There have been studies linking marijuana use to an increased risk of psychiatric disorders such as depression and anxiety. However, it is unknown to what extent marijuana actually causes psychiatric conditions. The same genetic and environmental risk factors that play a role in substance abuse are also linked to a higher risk of mental health disorders. It is also commonly accepted that a portion of people with mental health conditions will turn to marijuana as a way to self-medicate the most bothersome symptoms of their condition. If their mental health issues are properly addressed, they no longer feel the need to engage in substance abuse. It is very difficult for researchers to ethically study the effect of prenatal marijuana exposure, but studies following the children of women who self-reported marijuana use during pregnancy have found an increased risk of hyperactivity and developmental disorders. Evidence is mixed as to whether marijuana use is linked to premature birth, but research indicates pregnant women who use marijuana are 2.3 times more likely to experience a stillbirth. Test of confiscated marijuana have shown that THC levels are rising rapidly. In the 1990s, the average THC content was about 3.7%. By 2014, THC content had jumped to 6.1%. The newer practice of dabbing, smoking or eating THC-rich hash oil from a marijuana plant, can deliver more than 50% THC. Rising THC levels are concerning to healthcare professionals because they are thought to increase the negative effects of marijuana on both short term and long term brain function.